Over the last few days, I’ve been concerned with how the baby boy’s weight gain has stagnated. He’s not losing weight – he’s just definitely not been gaining at a rate that I’m comfortable with. It’s a hard thing to explain to anyone who’s never had puppies – the fine line between a puppy who’s thriving, and one who’s not. The scariest thing about puppies this tiny is how rapidly a ‘slow weight gain’ can turn into a fading puppy – and once they start to fade, it’s really hard to reverse that process. So, I’ve been bottle feeding him the last few days, just to supplement the food he’s getting from Sailor, and to give him the chance to get a head start. The bottle formula I use is about 12-13 calories per cc – a high calorie, rich formula that isn’t meant to be used as a permanent replacement for mother’s milk, but rather as a supplemental addition to it. Every three to four hours, I warm up some formula and sit down with the boy to feed him. Luckily for me, he’s an eager eater – a nice change from those puppies that refuse to eat. After the break, there’s a little movie clip of him being bottle fed. You’ll be able to see how voraciously he goes after a finger, if the bottle isn’t close enough at hand. By the way, I think the cam isn’t going to work so long as I’m on satellite internet. This money gouging company has a throttle on how much data you can upload or download, and, as you can guess, a constant web feed can quickly chew up your bandwidth – resulting in my internet connection speed being choked down to less than dial up. Not practical, as you can imagine. So, until DSL makes it out here to the middle of no place, I’m going to limit the cam to a few hours a day – 3:00 pm EST to 6:00 pm EST, to be exact – which is the time period per day where I have unlimited bandwidth usage. Starting tomorrow, that’s when the cam will be on line. 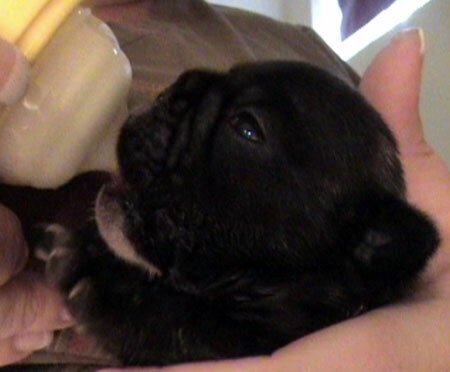 Don’t forget – bottle feeding movie clip after the cut, or you can view it here . I know you warned us (and yourself) not to fall in love yet, but I can’t help myself!